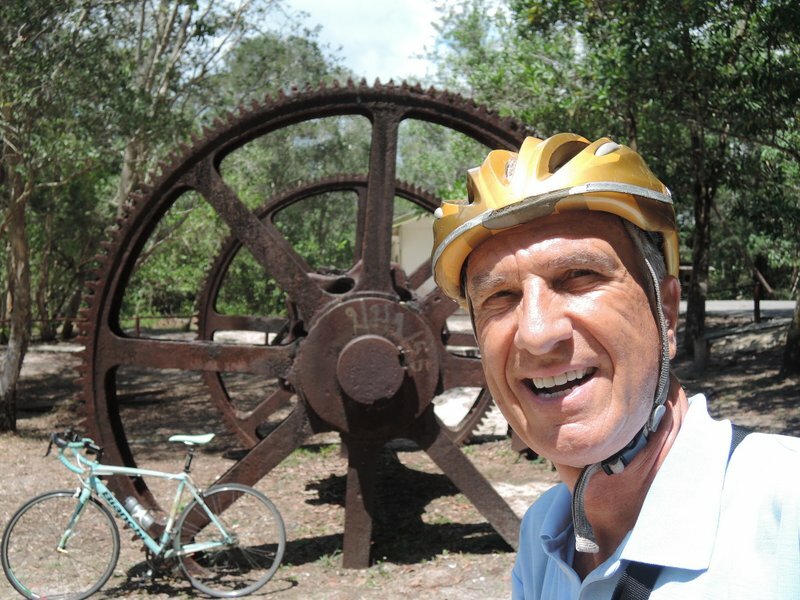 I am by no means original in my thoughts regarding the ability to travel through time on a bicycle. The Victorian novelist HG Wells was a tremendous bicycle lover to whom the quote, “Whenever I see an adult on a bicycle, I do not despair for the future of the human race” is often attributed. 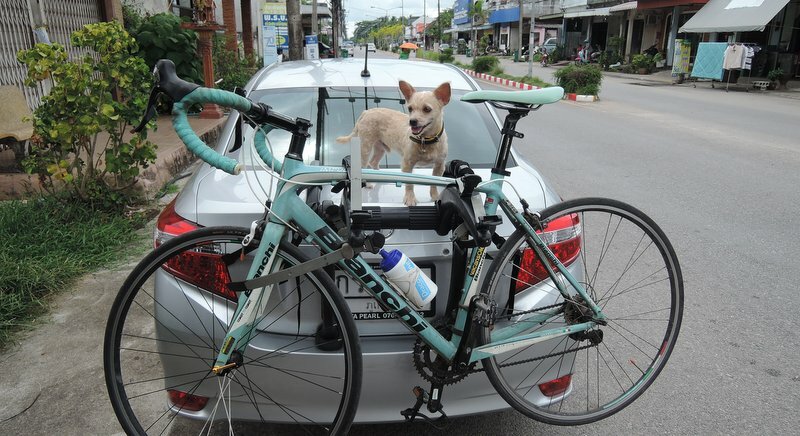 Baz’s trusty best friend Polar in Thai Mueang Town eagerly awaiting his chance to hit the road on two wheels. 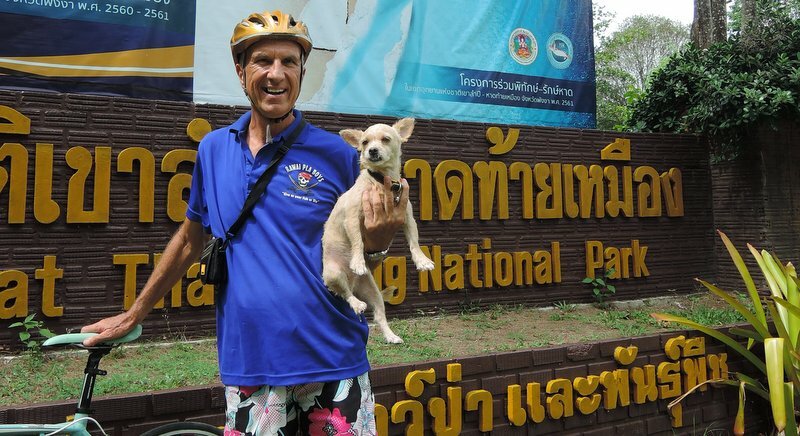 Baz and his trusty best friend Polar ride together through Thai Mueang National Park. Baz and Polar on the vast stretch of beach the forms part of the park. He is the only major author who has written a cycling novel and bicycles appear in many of his other works, most notably in his first novel The Time Machine, published in 1895, in which the time-travelling machine is oddly reminiscent of a bicycle, with a saddle that the rider straddles and controls with handlebars. Like most of us in Phuket these days I was feeling time-stressed and frazzled and in need of a gentler pace of life where time expands to facilitate some safe, relaxing cycling. 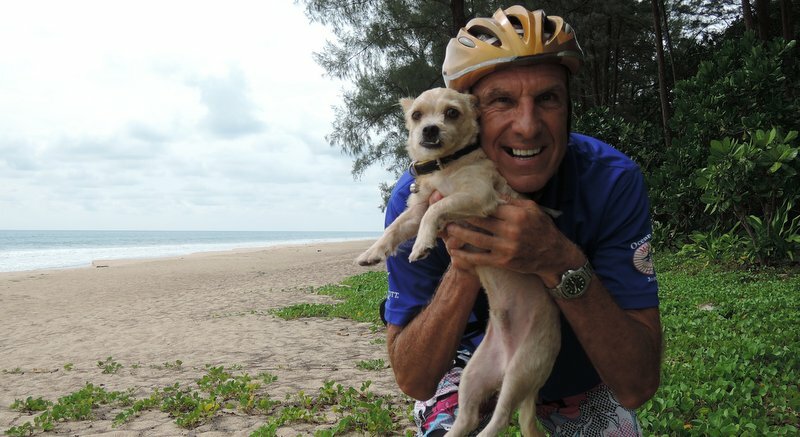 I drove off the island with my road bike on the bike rack and my little dog “Polar” for company. 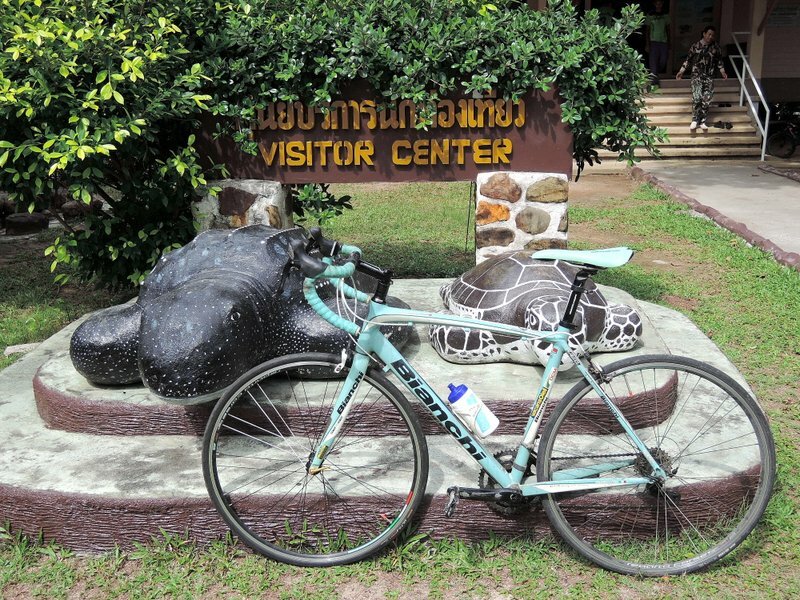 Just 25 kilometres north from the Sarasin Bridge we came to the Hat Thai Mueang National Park and discovered the wonderful time travelling possibilities that a simple bicycle can create in such a quiet location as this. The park is best known for its large waterfalls located in the mountainous eastern section, but for the gentler, time-slowing cycling that I was after, I chose to concentrate on the pristine 14km white sand Andaman Sea beach section fringed by mangrove forest just off the main Highway 4 north (Phetkasem Rd) where it runs through the unprepossessing town of Thai Mueang. A distinguishing feature of this stunning beach, and a prime reason for its protected status, is that it is a sea turtle nesting area. Between November and February Leatherback, Green, and Hawksbill turtles come to this stretch of beach to lay their eggs. In March, a local festival marks the joyous occasion when many of the newly-hatched baby turtles make their way to the sea. I unloaded my bike, packed Polar into a backpack and set off cycling north along the quiet beachside road towards the park’s entrance. 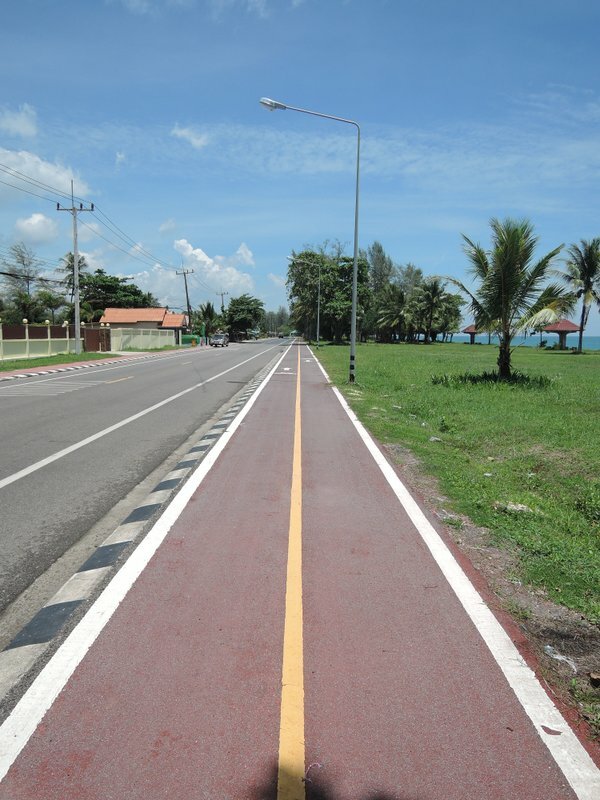 This six-kilometre stretch of quiet tree-lined road with separate cycling track represents an immediate step back in time to a gentler, more traditional Thai experience, of a sort which has virtually disappeared from Phuket itself these days. Birds twittered in the tall Casuarina trees that lined the road; the air was clean and well-oxygenated and the locals waved and sang out “hello” as we cycled past. On my left was the stunning beach and turquoise Andaman Sea crashing onto the sands, while to my right, in the distance, the mountainous spine of the Isthmus of Kra rose dramatically skyward. 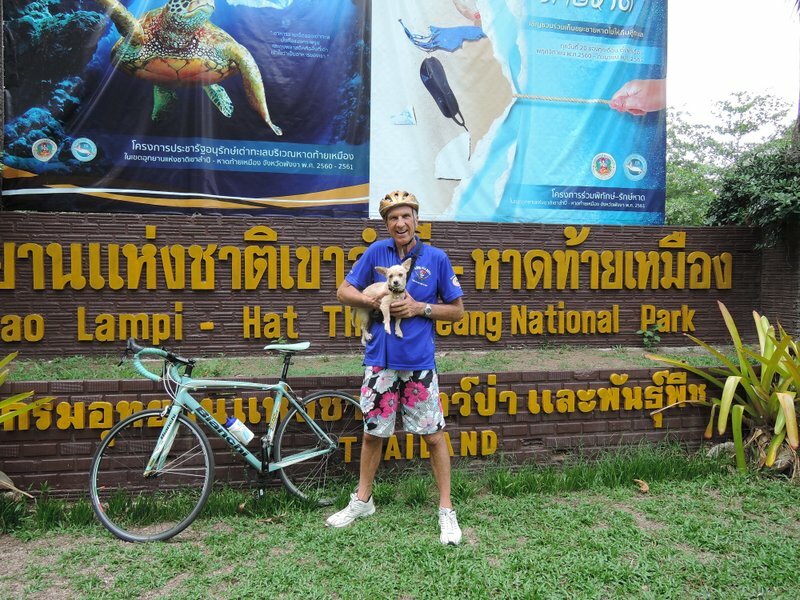 At the barrier into the National Park itself I paid my B100 entrance fee (dogs and bicycles enter free!) 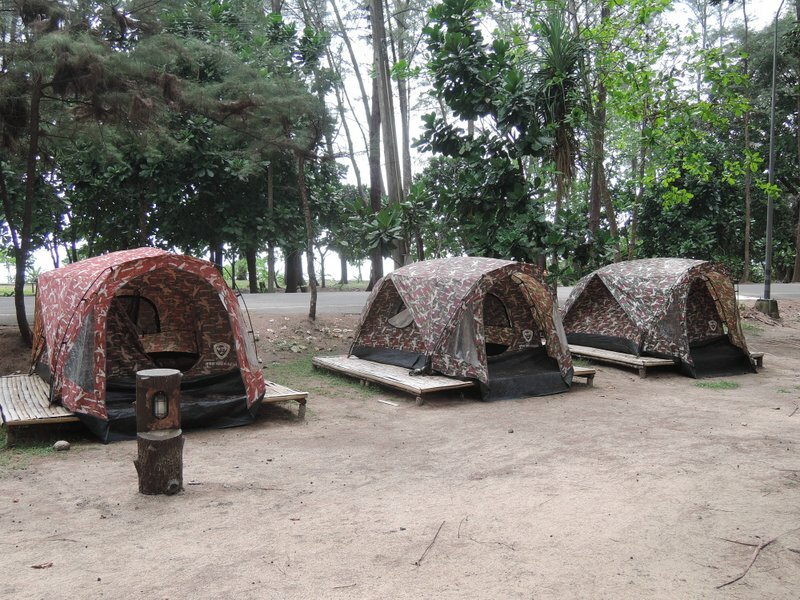 and cycled past the visitor centre and the rental cottages and camp tents all set enticingly among the verdant greenery. Another six kilometres of flat, shaded riding, during which we saw not a single vehicle, brought us to the northernmost extremity of the ride. Here a fabulous viewpoint looks north along the stunning beachscape toward Tap Lamu – with tree-clad headlands rearing up in the distance above the crashing ocean spume. Silently brooding and massive, tin-mining machinery stands ghostly sentinel in the forest here, by an old tin-dredging lagoon. This ancient reminder of the region’s history quietly rusting through the passing aeon, underlined the way in which our cycling trip had slowed down time for Polar and I. That night we camped in one of the park’s tents for the princely sum of B160 (plus B60 for a sleeping bag for me, while Polar made do with his natural fur coat). After supper we sat out under the stars, with a full moon slowly starting to glow over the Andaman Sea, and counted our blessings. The madness of Phuket seemed a long way away and lost in another time.